mikenova shared this story from Queens New York – Google News. Medics rushed Lewis to Mount Sinai Hospital Queens, where he died, according to authorities. The 20-year-old man lived in the nearby Queensbridge Houses, police said. Cops from the 114th Precinct in Astoria took to Twitter and asked people to avoid the area as police investigated the slaying. mikenova shared this story from Trump: we will grow everything – Google News. Trump’s team says the tax bill will pay for itself. It won’t. President Donald Trump speaks at a fundraiser at Cipriani in New York, Saturday, Dec. … The president gave the rosy assessment based on the economic upswing since he took office, which the president believes will be supercharged by tax cuts … We‘re going to be growing everything,” Mr. Trump said. mikenova shared this story from defense forum in Simi Valley – Google News. SIMI VALLEY, Calif. (Reuters) – U.S. Central Intelligence Agency Director Mike Pompeo said on Saturday he sent a letter to Iranian Major General Qassem Soleimani and Iranian leaders expressing concern regarding Iran’s increasingly threatening behavior in Iraq. Speaking during a panel at the annual Reagan National Defense Forum in Southern California, Pompeo said he sent the letter after the senior Iranian military commander had indicated that forces under his control might attack U.S. forces in Iraq. He did not specify the date. “What we were communicating to him in that letter was that we will hold he and Iran accountable for any attacks on American interests in Iraq by forces that are under their control,” Pompeo told the panel. Soleimani, who is the commander of foreign operations for Iran’s elite Revolutionary Guards, refused to open the letter, according to Pompeo, who took over the CIA in January. Iranian media earlier quoted Mohammad Mohammadi Golpayegani, a senior aide to Supreme Leader Ayatollah Ali Khamenei, as saying an unnamed CIA contact had tried to give a letter to Soleimani when he was in the Syrian town of Albu Kamal in November during the fighting against Islamic State. “I will not take your letter nor read it and I have nothing to say to these people,” Golpayegani quoted Soleimani as saying, according to the semi-official news agency Fars. Reuters reported in October that Soleimani had repeatedly warned Kurdish leaders in northern Iraq to withdraw from the oil city of Kirkuk or face an onslaught by Iraqi forces and allied Iranian-backed fighters, and had traveled to Iraq’s Kurdistan region to meet Kurdish leaders. The presence of Soleimani on the frontlines highlights Tehran’s heavy sway over policy in Iraq, and comes as Shi‘ite Iran seeks to win a proxy war in the Middle East with its regional rival and U.S. ally, Sunni Saudi Arabia. A U.S.-led coalition has been fighting Islamic State in Iraq and Syria and is often in proximity to Iran-allied militia fighting Isis there. “You need to only look to the past few weeks and the efforts of the Iranians to exert influence now in Northern Iraq in addition to other places in Iraq to see that Iranian efforts to be the hegemonic power throughout the Middle East continues to increase,” Pompeo said. The CIA chief said Saudi Arabia had grown more willing to share intelligence with other Middle Eastern nations regarding Iran and Islamist extremism. The Israeli government said last month that Israel had covert contacts with Saudi Arabia amid common concerns over Iran, a first disclosure by a senior official from either country of long-rumoured secret dealings. “We’ve seen them work with the Israelis to push back against terrorism throughout the Middle East, to the extent we can continue to develop those relationships and work alongside them – the Gulf states and broader Middle East will likely be more secure,” said Pompeo. 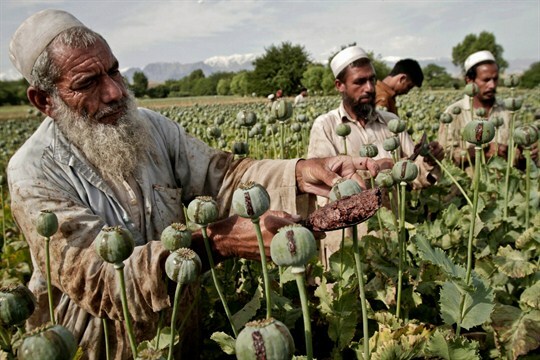 Afghan farmers collect raw opium as they work in a poppy field in the Khogyani district of Jalalabad, east of Kabul, Afghanistan, May 10, 2013 (AP photo by Rahmat Gul). mikenova shared this story from plan to privatize CIA operations – Google News. President Donald Trump’s administration is reportedly planning to pay millions to a private international security firm and is also considering allowing former U.S. … intelligence on terrorists using “a network of assets in a denied area”, an online propaganda operation to counter Islamic extremism, and the rendition plan. Is Steve Bannon Planning to Unleash Erik Prince on Wyoming Sen. … a former Australian air force pilot, and a lawyer with dual citizenship in the U.S. and Israel . . . to secretly rebuild his private CIA and special operations enterprise by setting up foreign shell companies and offering paramilitary services.”. mikenova shared this story from Washington Free Beacon. FBI Director Christopher Wray warned Thursday that adversarial governments are more often collaborating with criminals to carryout cyber attacks against the United States. The Justice Department announced charges in March against Karim Baratov, a 22-year-old Canadian citizen, and three other men, including two officers of Russia’s Federal Security Service, or FSB, for their involvement in the 2014 hack into Yahoo that affected 500 million accounts. U.S. law enforcement officials said Baratov, who they dubbed a “hacker-for-hire,” acknowledged breaking into email accounts and selling the passwords to an agent of the FSB, a Russian intelligence agency. The individuals targeted included Russian officials, a European diplomat, a former economic minister from a neighboring country, and a prominent banker. The case confirmed longstanding suspicions that Russia’s government hires non-government hackers and uses its spy services to facilitate criminal activity in addition to conducting espionage. To combat the threat, Wray said he has set up a “foreign influence task force” within the bureau made up of different divisions, including counterintelligence, cyber, and criminal investigation. He said the agency would also coordinate closely with the Department of Homeland Security, which is charged with overseeing critical election infrastructure, to prevent against cyberattacks. The post FBI Warns of Mounting Collaboration Between Nations, Criminals to Launch Cyberattacksappeared first on Washington Free Beacon. mikenova shared this story from intelNews.org. The United States Central Intelligence Agency and the White House are considering several proposals to hire private companies to carry out covert operations abroad, according to a report. mikenova shared this story from global security – Google News. mikenova shared this story from Defense One – All Content. A screenshot of the warning screen from a purported ransomware attack, as captured by a computer user in Taiwan, is seen on a laptop in Beijing, May 13, 2017.
mikenova shared this story from Defense Intelligence Agency – Google News. mikenova shared this story from Lt. Gen. Robert Ashley – Google News. Lt. Gen. Robert P. Ashley, Jr., U.S. Army, was recently confirmed by the U.S. Senate as the 21st Director of the Defense Intelligence Agency (DIA). Currently serving as deputy chief of staff, G-2, for the U.S. Army, Ashley is scheduled to begin his duties as DIA director in October, where he takes over for Lt.
Marine Corps Lt. Gen. Vincent R. Stewart turned over the reins to Army Lt. Gen. Robert P. Ashley during the ceremony at the agency’s Joint Base Anacostia-Bolling headquarters. Deputy Defense Secretary Pat Shanahan represented Defense Secretary Jim Mattis at the ceremony and presided over it. mikenova shared this story from Defense Intelligence Agency News. Vice President Mike Pence visited the Defense Intelligence Agency Headquarters at Joint Base Anacostia-Bolling Nov. 6, to receive classified intelligence briefings and meet with DIA officers. mikenova shared this story from Federal Bureau of Investigation. Michael Flynns guilty plea raises obvious questions: What did President Trump know? And when did he know it? The special counsel had a top agent removed from his inquiry after the Justice Departments inspector general began examining whether the agent sent texts expressing political views. mikenova shared this story from Stars and Stripes. Michael Flynn’s guilty plea Friday and all of the criminal cases thus far have not resolved the fundamental question special counsel Robert Mueller is seeking to answer: Did Trump’s campaign collude with Russia to win the election? The bribes federal agent Christopher Ciccione accepted from a wanted Colombian drug lord $18,000 in cash, prostitutes, restaurant meals and a hotel room have cost him his career. Yet, “Chris is a good man who served his country for more than 20 years both in the military and as a federal agent,” his defense attorney said. A white sedan whisked a man into the loading dock of a glass and concrete building in a drab office district in Southwest Washington. Security guards quickly waved the vehicle inside, then pushed a button that closed the garage door and shielded the guest’s arrival from public view. With his stealth morning arrival Thursday, White House Counsel Donald F. McGahn II became the latest in a string of high-level witnesses to enter the secretive nerve center of special counsel Robert S. Mueller III’s investigation into Russian interference in the 2016 election. Twenty hours later, Mueller and his team emerged into public view to rattle Washington with the dramatic announcement that former national security adviser Michael Flynn would plead guilty to lying to the FBI. The ensnaring of Flynn, the second former aide to President Trump to cooperate with the inquiry, serves as the latest indication that Mueller’s operation is rapidly pursuing an expansive mission, drilling deeper into Trump’s inner circle. In the past two months, Mueller and his deputies have received private debriefs from two dozen current and former Trump advisers, each of whom has made the trek to the special counsel’s secure office suite. Once inside, most witnesses are seated in a windowless conference room where two- and three-person teams of FBI agents and prosecutors rotate in and out, pressing them for answers. Among the topics that have been of keen interest to investigators: how foreign government officials and their emissaries contacted Trump officials, as well as the actions and interplay of Flynn and Jared Kushner, the president’s son-in-law. Often listening in is the special counsel himself, a sphinx-like presence who sits quietly along the wall for portions of key interviews. This picture of Mueller’s operation — drawn from descriptions of witnesses, lawyers and others briefed on the interviews — provides a rare look inside the high-stakes investigation that could implicate Trump’s circle and determine the future of his presidency. The locked-down nature of the probe has left both the witnesses and the public scrutinizing every move of the special counsel for meaning, without any certainty about the full scope of his investigation. Trump and his lawyers have expressed confidence that Mueller will swiftly conclude his examination of the White House, perhaps even by the year’s end. Trump’s Democratic opponents hope the investigation will uncover more crimes and ultimately force the president’s removal from office. Meanwhile, some witnesses who have been interviewed came away with the impression that the probe is unfolding and far from over. A spokesman for Mueller declined to comment, citing the sensitivity of the ongoing investigation. White House lawyer Ty Cobb said he believes the probe’s focus on Trump’s White House is wrapping up, noting that all White House staffer interviews will be completed by the end of next week. At least two dozen people who traveled in Trump’s orbit in 2016 and 2017 — on the campaign trail, in his transition operation and then in the White House — have been questioned in the past 10 weeks, according to people familiar with the interviews. The most high profile is Kushner, who met with Mueller’s team in November, as well as former chief of staff Reince Priebus and former press secretary Sean Spicer. Former foreign policy adviser J.D. Gordon has also been interviewed. White House communications director Hope Hicks was scheduled to sit down with Mueller’s team a few days before Thanksgiving. Mueller’s team has also indicated plans to interview senior associate White House counsel James Burnham and policy adviser Stephen Miller. McGahn, who was interviewed by Mueller’s prosecutors for a full day Thursday, was scheduled to return Friday to complete his interview. However, the special counsel postponed the session as a courtesy to allow McGahn to help the White House manage the response to Flynn’s plea, a person familiar with the interview said. Cobb declined to say which White House aides remain to be interviewed. Several people who worked shoulder to shoulder with Flynn have also been interviewed by Mueller’s operation. That includes retired Gen. Keith Kellogg, the chief of staff to the National Security Council, as well as several people who worked with Flynn Intel Group, a now-shuttered private consulting firm. Mueller’s group has also inquired whether Flynn recommended specific foreign meetings to senior aides, including Kushner. Investigators were particularly interested in how certain foreign officials got on Kushner’s calendar and the discussions that Flynn and Kushner had about those encounters, according to people familiar with the questions. During the transition, Kushner and Flynn met with the Russian ambassador to the United States, Sergey Kislyak. At the early December meeting, Kushner suggested establishing a secure communications line between Trump officials and the Kremlin at a Russian diplomatic facility, according to U.S. officials who reviewed intelligence reports describing Kislyak’s account. Kushner has said that Kislyak sought the secure line as a way for Russian generals to communicate to the incoming administration about U.S. policy on Syria. Trump’s son-in-law has also been identified by people familiar with his role as the “very senior member” of the transition team who directed Flynn in December to reach out to Kislyak and lobby him about a U.N. resolution on Israeli settlements, according to new court filings. The volume of questions about Kushner in their interviews surprised some witnesses. “I remember specifically being asked about Jared a number of times,” said one witness. Another witness said agents and prosecutors repeatedly asked him about Trump’s decision-making during the May weekend he decided to fire FBI Director James B. Comey. Prosecutors inquired whether Kushner had pushed the president to jettison Comey, according to two people familiar with the interview. Kushner attorney Abbe Lowell declined to comment on what the president’s son-in-law discussed at his November session with Mueller. “Mr. Kushner has voluntarily cooperated with all relevant inquiries and will continue to do so,” he said. Two administration officials said that it would be natural for investigators to ask a lot of questions about Kushner, whom Trump put in charge of communicating with foreign officials, adding that such inquiries do not indicate he is a target. The special counsel has continued to make ongoing requests for records from associates of the Trump campaign, according to two people familiar with the requests. The campaign associates aren’t expected to finish producing these documents by the end of the year. Mueller’s team is also newly scrutinizing an Alexandria-based office and advisers who worked there on foreign policy for the campaign. In the past several weeks, Mueller’s operation has reached out to new witnesses in Trump’s circle, telling them they may be asked to come in for an interview. One person who was recently contacted said it is hard to find a lawyer available for advice on how to interact with the special counsel because so many Trump aides have already hired attorneys. People who have gone before Mueller’s team describe polite but detailed and intense grillings that at times have lasted all day and involved more than a dozen investigators. Spicer, for example, was in the office from about 10 a.m. until 6 p.m. for his fall session. Mueller’s team has recommended nearby lunch spots, but many witnesses have food brought in for fear of being spotted if they go outside. Mueller has attended some interviews, introducing himself to witnesses when he enters and then sitting along the wall. Sometimes he is joined by his deputy, longtime friend and law partner James Quarles, a former Watergate prosecutor who is the main point of contact for the White House. Some witnesses were introduced to so many federal agents and lawyers that they later lamented that they had largely forgotten many of their names by the time one team left the room and a new team entered. One contingent of investigators is focused on whether Trump tried to obstruct justice and head off the investigation into Russian meddling by firing Comey in May. Prosecutors Brandon Van Grack and Jeannie Rhee have been involved in matters related to Flynn. Yet another team is led by the former head of the Justice Department’s fraud prosecutions, Andrew Weissman, and foreign bribery expert Greg Andres. Those investigators queried lobbyists from some of the most powerful lobby shops in town about their interactions with former Trump campaign chairman Paul Manafort and campaign adviser Rick Gates. News and analysis on the deadliest mass shooting in U.S. history. The day’s most important stories. Mueller’s team charged Manafort and Gates last month with engaging in a conspiracy to hide millions of dollars in hidden foreign accounts and secretly creating an elaborate cover story to conceal their lobbying work for a former Ukrainian president and his pro-Russia political party. Both have pleaded not guilty. Lawyers familiar with prosecutors’ questions about Manafort said they expect several more charges to come from this portion of the case. People familiar with the Mueller team said they convey a sense of calm that is unsettling. mikenova shared this story from mueller – Google News. mikenova shared this story from Donald Trump. The former national security adviser may testify that a senior member of Trump’s transition team told him to contact Russia about an upcoming United Nations vote. mikenova shared this story from Emails Investigation Reopening – Google News. mikenova shared this story from 1. Trump Investigation – Mike Flynn from mikenova (9 sites). Staunton, December 2 In an open letter to Vladimir Putin, demographer Yury Krupnov says that the demographic situation in Russia is rapidly becoming so dire that the Kremlin can only reverse it be creating an Extraordinary Demographic Commission or a Cheka for Demography. Krupnov says that he fully supports Putins call for doing more to promote Russias demographic well-being but says that he cannot fully agree that the Kremlin leaders idea of providing funds to families on the birth of even their first child will be sufficient or even effective (ruskline.ru/news_rl/2017/12/02/my_obvalno_padaem_v_demograficheskuyu_yamu/). Giving mothers 10,000 rubles (150 US dollars) a month after the birth of a child, he says, wont lead more Russians to have more children and thus will not save the country from a deepening demographic catastrophe, one brought on Krupnov says by the failure of the government to act on Putins 2012 call for making three-child families the norm. Instead, he says, the Russian authorities have behaved in ways that make childless or only one-child families the norm for Russians. To reverse that, Krupnov argues, the government should instead provide funds for those who have a third, fourth or fifth child in order to prompt people to have the first and second in order to get support for more later. According to Krupnov, who has long beaten the drums for larger families, Russia is rapidly falling into a demographic hole which will be just as deep if not deeper than the hole of the end of the 1990s, when the expression, the Russian cross, emerged. Krupnov says he fears that officials have been misleading Putin about just how bad things are and are likely to become. As a result, the real horror of the situation is not just how serious things have become but rather the failure of the authorities to discuss it seriously and not engage in ideological fantasies about supposed improvements. In this extraordinary situation, he continues, I consider it critically necessary to organize a serious, deep and open discussion of what demographic policy the country needs and via this to sharply push forward and deepen the understanding of the demographic problem as a priority for the country. To that end, Krupnov suggests the formation of an Extraordinary Demographic Commission (CheDemKa) which in the course of approximately a year could come up with an adequate complex of measures for the demographic salvation of the country. Such measures given the seriousness of the problem will necessarily be extraordinary. Today, Krupnov says, it should be obvious to all that the main problem of the country is in demography and thus is it is entirely appropriate to call for an Extraordinary Commission to address that problem. Putins speech earlier this week has led others to focus on just how bad the demographic situation in Russia now is, a situation in which the declining number of women in prime child-bearing ages is combining with changing family size preferences and the impact of the economic crisis to drive birthrates down. nakanune.ru/news/2017/12/02/22491294/and nakanune.ru/articles/113511/. But three things about Krupnovs letter are striking. First, he attacks the government in order to try to get Putin on his side, the latest of the good tsar-bad boyar view that l so much of Russian thinking. Second, by talking about a Cheka, he equates the demographic problem now to the threats to the Soviet state in its earliest days, an equation that will likely lead more people to focus on the demographic disaster that Russia is facing and that there are very few means the government has at its disposal to address. And third, and most important, by calling for a Cheka in this area, Krupnov has appealed to one of Putins core views on how to act: not by gradual effort but by extraordinary intervention, an approach that has its roots in the Soviet past but that continues to define his approach, however ineffective it is likely to be in this area as well as in many others. The White House national security advisor says the possibility of war with impoverished, but nuclear-armed North Korea is “increasing every day.” “There are ways to address this problem short of armed conflict,” H.R. McMaster said Saturday, “but it is a race because he’s getting closer and closer and there’s not much time left,” in a reference to North Korean leader Kim Jong-un. North Korea announced last week that it can now hit the U.S. mainland with a warhead, after its test-firing of a new intercontinental ballistic missile. Media reports say the Pentagon is looking at U.S. west coast sites where additional defense systems can be installed, following the North Korean threat of a strike on the U.S. The Reuters news agency says the defenses would likely include Terminal High Altitude Area Defense (THAAD) anti-ballistic missiles, similar to those deployed in South Korea. “The newly developed intercontinental ballistic missile Hwasong-15 has been successfully test-launched according to the political decision and strategic judgement of the Workers’ Party of Korea, read an announcer Wednesday on North Koreas state-run KRT television. Following previous launches, the North has claimed its projectiles can hit any part of the continental United States, but this would be the first time it would be able to do so with this new type of upgraded missile, which both North Korean and U.S. officials said could fly higher than the ones the country has tested earlier. McMaster urged China to slap a total oil embargo on North Korea, as a way of deterring fuel missile launches. “You can’t shoot a missile without fuel,” he said. North Korea, meanwhile, characterized the U.S. and South Korea as “warmongers” Sunday, a day ahead of the U.S. and South Korea’s largest-ever joint air exercises. The North’s ruling party Rodong newspaper said Sunday the joint exercises are “an open, all-out provocation against” North Korea that could “lead to a nuclear war any moment.” It is not clear if Pyongyang has mastered the capability of miniaturizing and mounting a nuclear warhead on an ICBM, which South Korean officials have said could happen within a matter of months. Analysts also question North Koreas technical mastery of ICBM re-entry, which plays a key role in targeting. In the event of a launch at the U.S. mainland, U.S. missile defense systems would be employed. Give us 5 minutes, and we’ll give you the world. Around the clock, Voice of America keeps you in touch with the latest news. We bring you reports from our correspondents and interviews with newsmakers from across the world. Around 20,000 Israelis have protested in Tel Aviv against corruption and legislation they say is designed to protect Prime Minister Benjamin Netanyahu from investigation. Netanyahu is suspected in two corruption cases. The head of Britain’s top cybersecurity agency has warned the U.K. government against using Russian antivirus products amid concerns surrounding Kaspersky Lab, the Moscow-based software vendor recently banned by U.S. officials over its alleged ties to Russian intelligence. President Donald Trump on Friday dismissed press reports that he plans on firing Secretary of State Rex Tillerson, calling them “fake news” in a tweet. Trump’s comments followed multiple reports, citing administration officials, that the White House has developed a plan to oust Tillerson and replace him with CIA Director Mike Pompeo, who in turn would be replaced by Republican Sen. Tom Cotton (Ark.). The tweet also linked to a post on Trump’s Instagram account, which includes a picture of Tillerson’s swearing-in ceremony. Trump has frequently been at odds with Tillerson, airing some of their disagreements publicly. The president once said that Tillerson was “wasting his time trying to negotiate” with North Korean leader Kim Jong-un. “Save your energy, Rex, we’ll do what has to be done,” he tweeted. In October, both Trump and Tillerson denied reports that the secretary of state threatened to resign, calling them “fake news.” Some news outlets reported at the time that Tillerson had privately called Trump a “moron” at a meeting over the summer. The post Trump Calls Reports That He Will Fire Tillerson ‘Fake News’ appeared first on Washington Free Beacon. Secretary of Defense James Mattis is beginning his five-day tour of the Middle East on Friday. The Department of Defense announced that Mattis will visit Egypt, Jordan, Pakistan, and Kuwait. During his time in Egypt on Saturday, Mattis will meet with Egyptian President Abdel-Fattah el-Sissi and Defense Minister Gen. Sedki Sobhi. Mattis will then go to Jordan on Sunday, where King Abdullah II will host a conference on combating extremism in West Africa. Attendees of the meeting in Jordan will include representatives from many countries in Africa and Europe. Mattis will meet with Pakistani Prime Minister Shahid Khaqan Abbasi and Gen. Qamar Bajwa, who serves as Chief of Army Staff, on Monday. His final stop will be in Kuwait Tuesday, where he will meet with Kuwaiti Emir Sheikh Sabah Al Ahmad Al Sabah. Mattis is well known in the region due to his time as commander of U.S. Central Command, which focuses on the Middle East. Mattis had traveled throughout much of the region then and met with regional and local leaders. The post Mattis Begins Five-Day Tour of the Middle East appeared first on Washington Free Beacon.